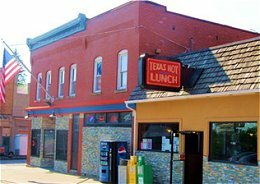 The Texas Hot Lunch 4 Sons on 24 Field Street in Kane, Pennsylvania, has been a favorite local restaurant run by the Bechakas family since 1914. This “hot dog” joint, casual dining, family-style restaurant is a chosen spot to enjoy a scrumptious breakfast, lunch or dinner. 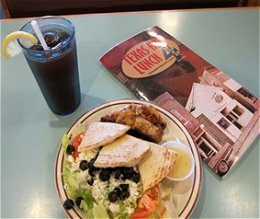 Try the always popular Souvlaki Dinner with Greek salad, Pita Pleasers and Gyros or the famous Texas Hot – with a recipe that dates back to 1914 – a plump, juicy hot dog with a squirt of mustard, sprinkled with onions, and smothered with their famous sauce. Enjoy a chipotle chicken sub, a ½ rack of ribs, a Texas meatball sub, spicy chicken tenders, or their renowned homemade Mediterranean vegetable bean soup or Mexican-Style Chili. Order a slice of their house specialty pie or a have scrumptious sundae for dessert! Texas Hot Lunch 4 Sons offers a banquet room – The Social Room – a private dining room that holds 24 in a relaxed and comfortable atmosphere. Reservations are required.